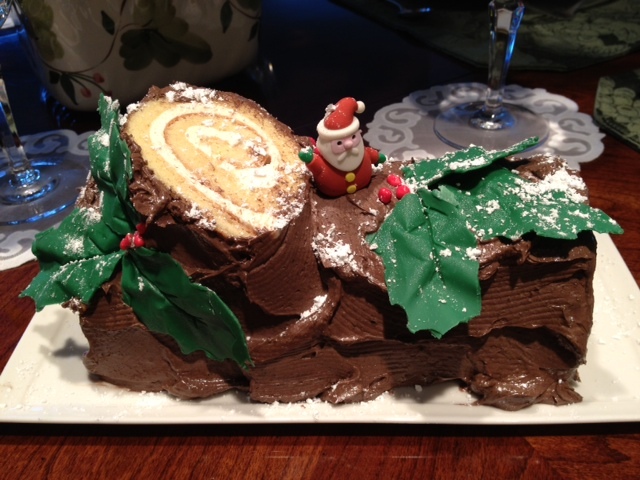 The French traditional cake for Christmas is a Buche de Noel. 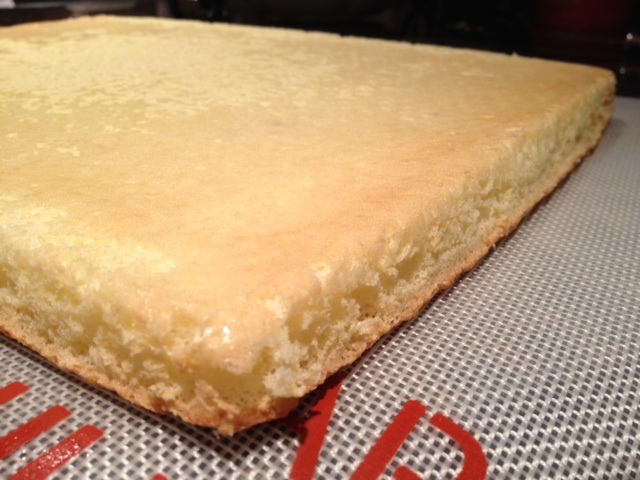 This traditional dessert is served near Christmas (as Noël refers to the birth of Christ) in France, Belgium, Canada, Lebanon, Vietnam, and several other francophone countries and former French colonies. As the name indicates, the cake is generally prepared, presented, and garnished so as to look like a log ready for the fire used in the ancient fire-festival of the winter solstice. A Yule log was a large and extremely hard log which is burned in the hearth as a part of traditional Yule or Christmas celebrations in several European cultures. It was also associated with the Winter Solstice festival or the Twelve Days of Christmas, Christmas Eve, Christmas Day, or Twelfth Night. The tradition of the Yule log was discontinued as large fireplaces became an increasingly rarer feature of the average living room. 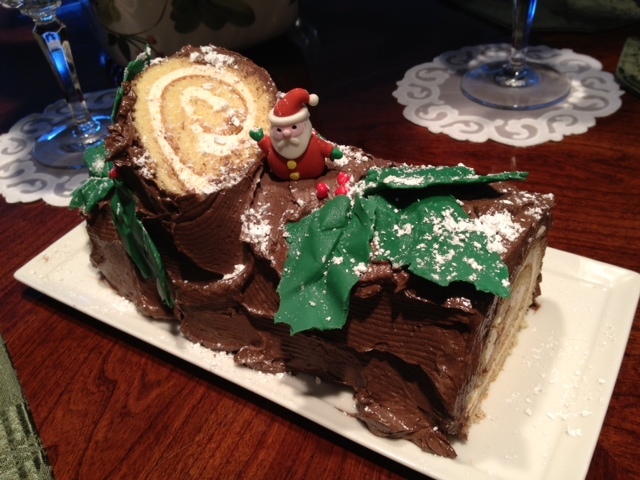 The dessert is usually in the form of a large rectangular yellow cake spread with frosting and rolled up into a cylinder – one end is then lopped off and stood on end to indicate the rings of the “log.” It is not known when the dessert, or its name, originated. It is known to have existed by 1945, and apparently, a tradition of jam rolls served at Christmas is attested for Poitou-Charentes since the 19th century (Wikipedia). The traditional bûche is made from a Génoise or other sponge cake, generally baked in a large, shallow Swiss roll pan, frosted, rolled to form a cylinder, and frosted again on the outside. The most common combination is a basic yellow sponge cake, frosted and filled with chocolate buttercream; however, many variations on the traditional recipe exist, possibly including chocolate cakes, ganache and espresso or otherwise-flavored frostings and fillings. Ingredients: 10 eggs, 6 sticks of butter, 4 oz of dark bittersweet chocolate, cocoa powder, sugar, flour, baking powder, powdered sugar, 1 bag of green colored chocolate chips of 4 oz of chocolate chips and green coloring. Break 4 eggs into a mixing bowl, add 3/4 cup of sugar and beat until the egg mixture is becoming foamy and is doubling in size. In another bowl, place 1/2 cups of flour and 3/4 tsp of baking powder, 1/4 tsp f salt and mix well. Slowly incorporate the flour mixture into the egg and mix gently. Empty the content of the egg mixture into the flexipan and cook in a warm oven at 400 for 8-10 minutes or until the dough is looking light brown. 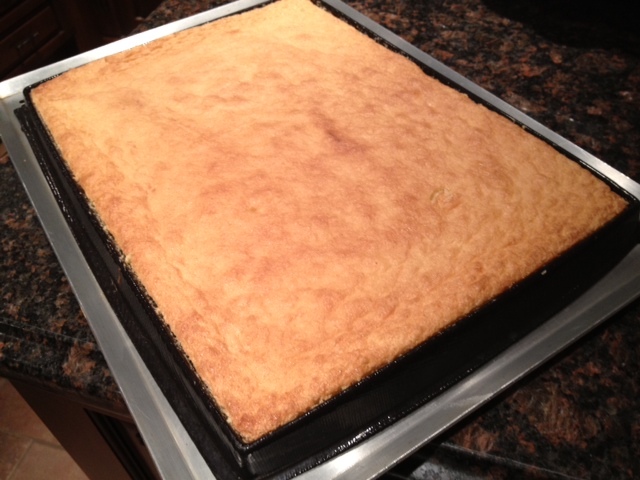 Remove the cake pan from the oven, Flip the flexipan over a roulpat and roll the cake into a “jelly roll”. Let the dough cool. Vanilla frosting: 3 large egg whites at room temperature, 3/4 cup of sugar, 3 sticks of butter at room temperature, 1 tbsp of vanilla aroma. Chocolate frosting: 3 large egg whites at room temperature, 3/4 cup of sugar, 3 sticks of butter at room temperature, 1 tbsp of vanilla aroma, 4 oz of chocolate chips melted and cool. In a large bowl combine the egg white and the sugar. Set the bowl over simmering water. Stir until the sugar has dissolved and the egg white mixture is warm to touch ( 160F). Remove from the saucepan and whip with an electronic mixer until the mixture is fluffy, and holds peaks. Slowly add the butter a little bit at a time, and continue beating until the frosting is smooth and creamy. Repeat the same for the chocolate frosting. At the end, add 4 oz of melted cool chocolate. To fix the cake, unroll the cake. Spoon the vanilla mixture over the inside of the cake ( you will have too much frosting). Then roll the cake over itself. 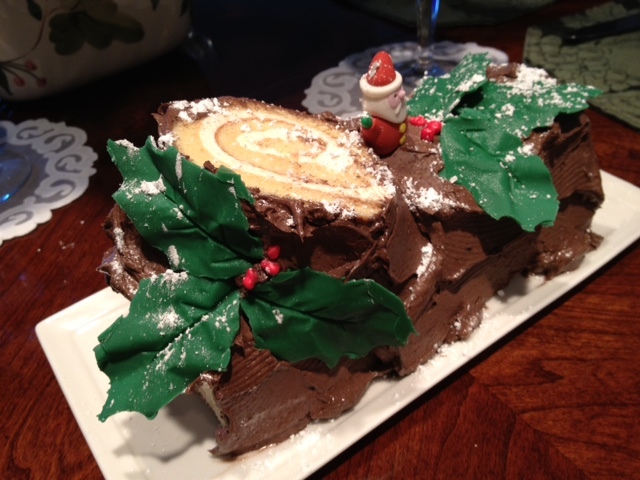 Then spread the chocolate frosting over the jelly roll, trying to make it look like an uneven wood trunk. Cut one small piece of the cake and place it onto the top to make like a cut-out branch. 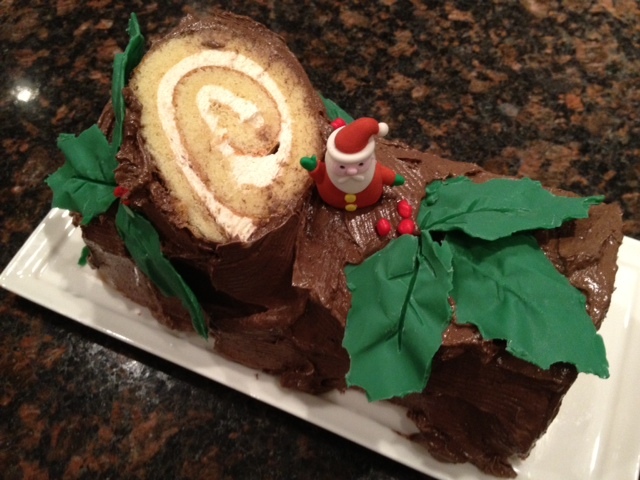 Sprinkle powdered sugar over the log to make it look like snow. For the holly leaves: 4 oz of green colored chocolate chips and plastic holly leaves. Nerd candies. With a pastry brush, brush the leaves with the melted chocolate. Let them cool and repeat the process 3 times for the leaves to be thick enough. Peel off the leaves and place on the buche as you like. Place a few red nerds to make the fruits of the holly. Et voila!